Those who have been on 14ers out in Colorado, California or Washington – or even been above 10,000 feet on any mountain – may look at Mount Washington’s relatively short 6,288-foot height and scoff. 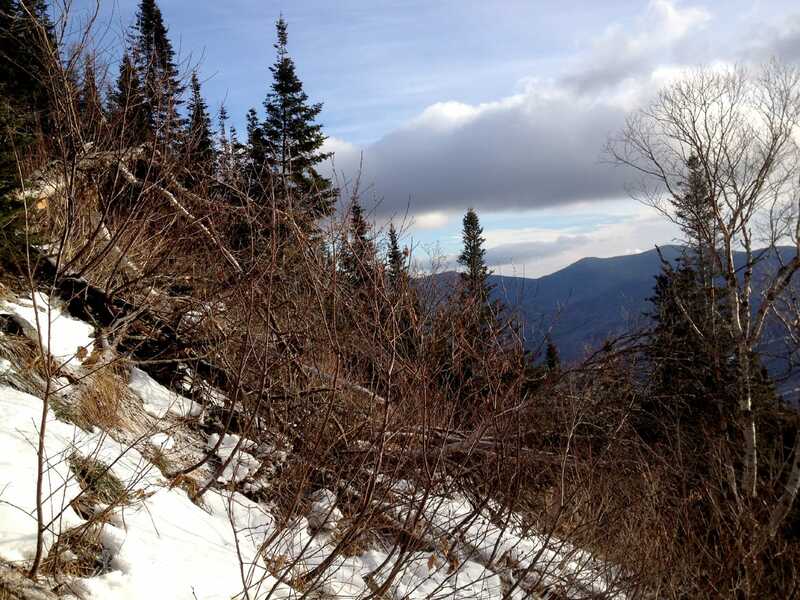 When I first encountered people talking about Mount Washington I didn’t scoff, a mountain is a mountain, but I was a little confused and definitely intrigued. Why would mountaineers list a winter Mt. 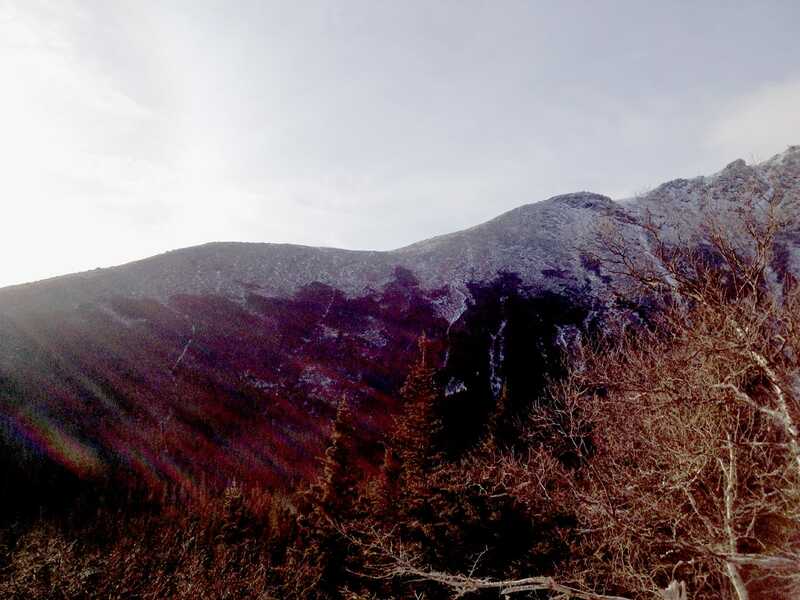 Washington ascent as a noteworthy accomplishment, alongside summits of Mt. Rainier, Mt. Shasta, and other similar big mountains? I had been watching the weather reports closely for days and the forecast called for temperature reaching -40 degrees Fahrenheit or lower and with wind gusts up to 85 mph. However, the forecast also called for winds to start scaling back to the 40- to 60-mph range later in the morning, and wind chill temperatures warming as a result. I was originally planning to hike a portion or all of the first 2+ miles in the morning darkness with my headlamp on. But with this forecast in mind, I scrapped my planned pre-dawn start and decided to head up right after sunrise. Even with my Yaktrax on for extra traction in this first section, it took much, much longer to reach the turn off to Lion Head than I had planned for. I would estimate that this section would take less than an hour for a fast hiker in the warmer months. But with my late start and the icy trail conditions, my day was already stretched. I sat down at the bottom of the Lion Head Trail to put my crampons on and unstrap my ice axe from my pack. As I did this, a large group of at least 20 climbers started up route ahead of me. Once I started heading up, I soon got stalled behind this large group. After a few minutes, I spoke with the trailing climber and they all agreed to kindly stepped aside and let me pass. As I passed, I marveled at how many in the group had only trekking poles and no ice axe. This was must-have-ice-axe territory in my book. 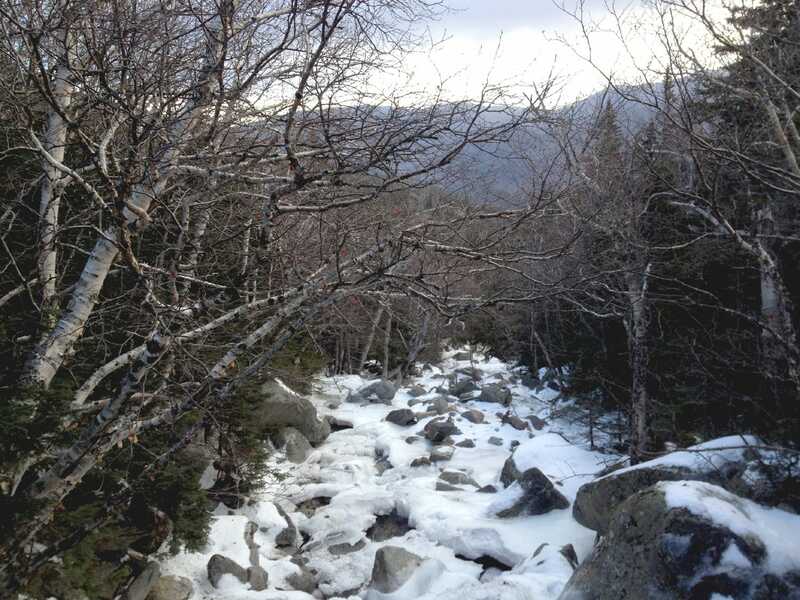 The climbing on this section was icy and steep – perfect for some ice axe and crampon work. I quickly worked my way up to Lion Head and promptly got slammed with strong wind gusts of maybe 60 mph. I took off my pack to add an extra outer layer, my balaclava and my goggles. Extra layer: check. Balaclava: check. Goggles? It turned out that before I headed up the trail, I have removed the waterproof bag that had my headlamp in it. I no longer needed the headlamp because of my post-sunrise start. Problem is, my goggles were in that bag, too. I made my way up through Lion Head and through the most exposed and windy sections of the climb. 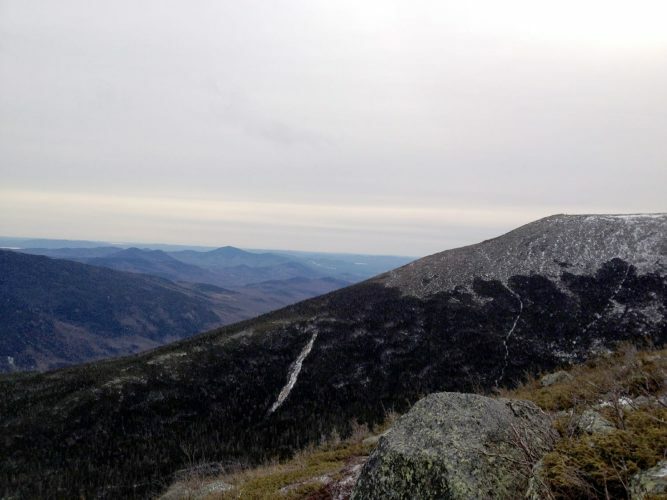 I stopped at the point where the Lion Head Trail reconnects with the Tuckerman Ravine Trail, which is less than 700 feet below the summit. Looking up the summit, it was enshrouded by dark clouds and it looked as if visibility would be close to zero. It was time for the decision. ESPN did not cover the moments leading up to my decision a la Lebron James during the days of his free agency, but it was an important decision for me nonetheless. In actuality, it was an easy decision, too, and I decided to turn back and head down. I didn’t have my all-important goggles and my right eye had been repeatedly frozen shut off and on for the past hour. Conditions were obviously poor up on the summit and it appeared that visibility would likely be an issue. And, in addition, I was up there a lot later than I wanted due to my later start and the slower-than-expected first portion of the hike. I talked with four other experienced climbers on this day, and three of them turned around before the summit and decided to try it another day. I was perfectly fine making it four out of five. With every hike and every climb I learn more. Now, I no longer have to debate the usefulness of goggles high on the mountain. I no longer have to guess what it feels like to be slammed with wind gusts of 60 to 70 mph while climbing. I no longer have to wonder if my layering system can hold up to wind chill temperatures of -40 degrees or lower while climbing. And, most importantly, I learned that taking things out of my pack at the last minute is a bad idea. I had packed and re-packed (and repacked) by backpack the previous night. Everything was just right. Was it really worth it to shave that half-pound of weight to get rid of my headlamp? No. Not at all. Next time, I leave the pack alone and head up the trail. Oh, and as far as Mount Washington goes: I’ll be back.